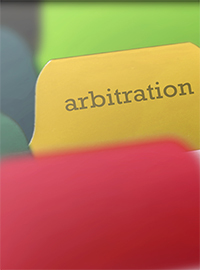 [T]he possibility of arbitration terrifies trial lawyers, because the ability to wring quick settlements or engage in attrition by litigation is greatly reduced. For anyone hoping to "drain the swamp" in America, there's no better place to start than with plaintiffs' lawyers and litigation abuse. And arbitration is an invaluable instrument toward that end. Although the topic of arbitration rarely occupies the center of American political debate, it deserves far greater emphasis than it receives. Greedy trial lawyers despise it, which should automatically create a presumption for most Americans that it's worth defending. For anyone unfamiliar with the process, "arbitration" simply refers to an alternative form of civil dispute resolution outside the confines of our overburdened court system. What typically occurs is that two parties mutually and voluntarily agree when entering into a contract or other legal relationship that any future lawsuit that may arise between them will be resolved through arbitration rather than the courts. If and when a dispute between the parties does arise, the process for filing suit, presenting evidence and reaching a decision is typically similar to how it would occur in a court of law, and the deciding arbitrator or team of arbitrators essentially acts in the role of a judge and jury. The decision ultimately reached after presentation of evidence and argumentation of the parties is legally binding, and enforceable just like a court verdict. Here's what makes arbitration so valuable. First, the arbitration process occurs far more quickly and efficiently than traditional litigation. With our judicial system as overrun as it is with lawsuits, moving from the initial complaint stage through discovery, trial and possibly appeal can take years or even decades. Arbitration, in contrast, is often completed within a matter of weeks or months. Second, the parties mutually agree on the arbitrators, instead of more random assignment as occurs in our clogged court system. Not only does that help avoid incompetent or biased judges, it also proves useful in highly technical disputes because arbitrators with particular expertise in the subject matter in dispute can be selected. Third, because arbitrators tend to be experienced and respected enough to be agreeable to both parties in the dispute, their judgments tend to be more sound and less subject to "jackpot jury" verdicts and outlandish awards. Fourth, arbitration proceedings can be made strictly confidential, which is far more difficult in public litigation. Those are just some of the advantages offered by arbitration as opposed to traditional court litigation, which explains why it's such an attractive option for parties entering into a voluntary relationship. But those advantages are also precisely why greedy trial lawyers, and the political left more generally, despise arbitration. After all, one of the most potent threats that plaintiff lawyers exploit is the possibility of costly, protracted, haphazard litigation that could end with an unpredictable jury verdict and an outlandish award that leads to even more litigation via appeal. On that basis, aggressive lawyers extract enormous settlements just via the threat of litigation, or drag out litigation in the hopes of forcing the other party to settlement just to avoid more litigation costs or bad publicity. Accordingly, the possibility of arbitration terrifies plaintiffs' lawyers, because the ability to wring quick settlements or engage in attrition by litigation is greatly reduced. So they resort to scare tactics like claiming that arbitration deprives victims of justice, which is flatly untrue because the law requires arbitration to satisfy the concepts of due process to be enforceable. And as noted above, the arbitration process essentially follows the typical litigation process, just with more speed, predictability and a reduced threat of drawn-out litigation or a "jackpot jury." So opponents of arbitration resort to attempting to have it prohibited. We witnessed a perfect illustration of that this month, when Consumer Financial Protection Bureau (CFPB) Director Richard Cordray finalized a regulation prohibiting mandatory arbitration provisions and class action waivers between financial firms and customers. That move defies Congressional directive, as well as the CFPB's own evidence of harm to consumers and the costs that class action litigation inflicts upon the federal banking system. As The Wall Street Journal noted, that threat led the Office of the Comptroller of Currency to determine that "community and mid-sized banks would have to hold greater reserves because of future expected litigation expenses, which could reduce lending." In other words, money that should go toward loans to consumers will instead be diverted to litigation. But no matter to Director Cordray, whose regulation serves greedy trial lawyers rather than American consumers or financial system wellbeing. Fortunately, Congress can rescind the new regulation through the Congressional Review Act, to be signed by President Trump within 60 days. Better yet, President Trump can finally dismiss Director Cordray for his latest instance of misconduct. In any event, the arbitration process remains an invaluable and under-appreciated tool in our hyper-litigious society, and one for which conservatives and libertarians should be ready to fight.